Above: With a mighty river and lakes small and great, Chicago is a towering city that gets to enjoy its own reflection. One beautiful way to appreciate Chicago architecture is to see it by kayak on a guided tour along the Chicago River. Most Iowans are familiar with Chicago, the big city of the Midwest. We know the museums, the art institute, the aquarium—the top-tier attractions that always reward our visits. For example, for a whole new perspective on the city, see it by kayak. “It’s much more fun than the tour boats and the best way to see the architecture,” Karin says. 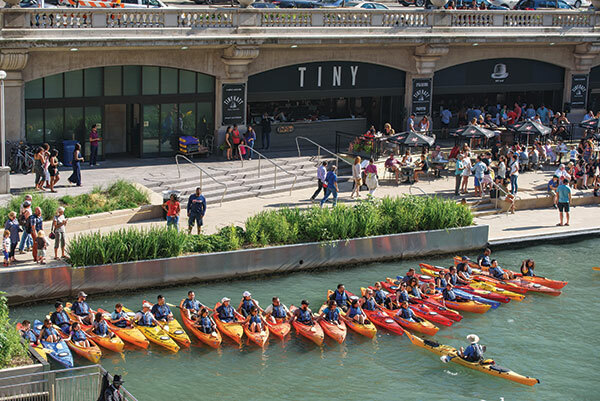 You can rent a kayak and get a guided tour of the city by river through Kayak Chicago. And on the subject of the Chicago River: “Take a water taxi instead of a cab,” Charlie suggests. It’s convenient and more engaging than reading a cabbie’s license info on his car’s security divider. “And avoid weekends if you can,” he adds. 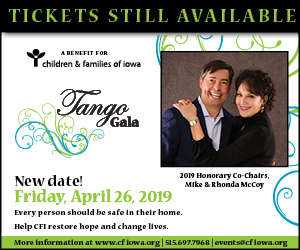 That’s easy for Charlie now that he’s retired from a career that included serving as publisher of The Des Moines Register and dean of the journalism and business schools at Drake University. Karin, an interior designer, works in Chicago as well as Des Moines. As part-time residents, they enjoy the pace of both cities, each with its own vibe. For them, Chicago represents an urban neighborhood plus great recreation. They love the downtown amenities—restaurants and cultural sites within a five-minute walk. Hidden Gem: One smaller attraction the Edwardses recommend is The Osaka Garden, a remnant of the 1893 World’s Columbian Exposition. It’s “so quiet and beautiful,” Karin says. With a waterfall and footbridges, it’s just a short distance south of the popular Museum of Science and Industry on Jackson Park’s Wooded Island. Located at 6401 S. Stony Island Ave., the garden is next to the site of the future Obama presidential library. 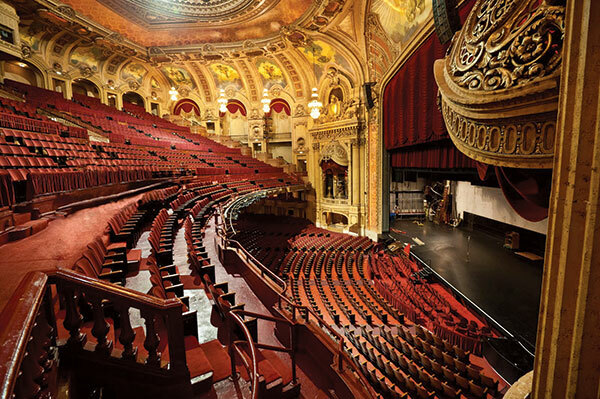 The Chicago Theater is a showpiece and a show unto itself, with daily tours. If Theater Is Your Thing: Within the downtown theater district, spanning a grid of about four blocks square, the 1921 Chicago Theater “is a treasure,” Karin says. Apart from outstanding performances, the theater is itself an attraction. She recommends the one-hour tour provided daily at noon. For $15, visitors are guided through fascinating areas of the theater, including a backstage wall that has been autographed by many famous performers over the years. If you’re attending the theater with friends and want to splurge, get a balcony box with a table for four and waiter service throughout the show. Also highly recommended: Chicago Shakespeare Theater and the Lyric Opera. Both have devoted local fans but may be overlooked by visitors to the city. A wash of white adds to the elegant ambience of The Public, a landmark hotel. A close second, for Charlie, is the Chicago Athletic, an 1890s athletic club reborn as a high-end hotel that overlooks Millennium Park, the Art Institute of Chicago and a panoramic view of Lake Michigan. Gene & Georgetti on North Franklin Street: “A classic, old-school steakhouse,” Karin says. The Boarding House on North Wells Street “is just fun to walk into,” she says. One dining room has a canopy of wine glasses, making the ceiling seem like a chandelier. For beverages on a special occasion, the Edwardses recommend the Violet Hour at 1520 N. Damen Ave. Revel in this dressy twist on a speakeasy with its whimsically “secret” door. “You have to know it’s there,” Karin says. You also have to abide by a quirky set of posted “house rules,” which include “proper attire,” a ban on baseball caps, and rejection of Budweiser, light beers and Cosmopolitans. That’s a fairly stiff welcome, but Charlie and Karin insist that Chicago overall is a friendly city. Compared with New Jersey, where Karin grew up, “everybody in Chicago has time for you.” Unless you want a light beer at the Violet Hour. The incidents, influences and insights that set career courses and transformed lives. Tradition yields to personality at local ceremonies and receptions.